In 1978, one of the strangest and most exhilarating comic book issues in DC’s history appeared in stores, featuring one of the greatest team-ups of all time: Superman and Muhammad Ali. Teaming up superheroes and real life personalities was a tried and true trick for comic books: Superman had been paired up with celebrities in the past, such as President John F. Kennedy and Bob Hope before, so when DC Comics wanted to put him together with the World Heavyweight Champion Muhammad Ali, it seemed like a match made in heaven. After all, Ali wasn’t too far off from being a superhero himself. Neal Adams noted that the idea came from Julius Schwartz at DC comics, who thought that teaming up the two would be a great idea. Everyone laughed at first, but the company’s publisher decided to go forward with it. They contacted Ali and went through lengthy negotiations to get approval to use his image. Dennis O’Neil came up with the story and began work writing the issue, but had to leave before it was finished. Adams took over, adapting O’Neil’s work and completed the book. The issue featured an alien race named the Scrubb demanding to fight Earth’s greatest champion. 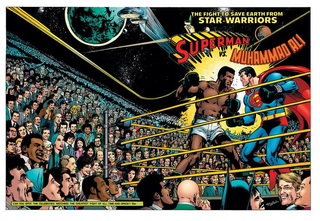 Muhammad Ali and Superman each step forward to take up the challenge to save Earth. When Ali argues that Superman isn’t a proper champion of Earth, the Scrubb leader, Rat’Lar, has them fight one another on the planet Bodace (where Superman’s powers are negated). Neal Adams drew the issue, which ran a long 72 pages and which came with a spectacular wraparound cover of Superman and Ali facing off. Joe Kubert provided the initial cover for the issue, featuring an excited crowd watching the pair face off. DC Comics didn’t think that original cover was joyous enough - it was too somber. Several people, including John Wayne, didn’t give approval to use their likenesses, so rather than redrawing the faces completely, Adams opted to add moustaches to faces. Ali had reportedly allowed his image to be used with one condition: his fictional self would have to discover Superman’s secret identity. (It’s also rumored that he wrote his own dialogue). The book was originally scheduled to be published in the fall of 1977, but was pushed back several times, first to the spring of 1978 and finally to the fall of 1978. During the delay, Ali actually lost his title of World Champion, utlimately regaining it in September 1978. The book would later be reprinted in 2010 as a hardcover. It’s time for the eight-year-old me to open that book and ask: Does the interior sizzle match the exterior hype? In the name of good unbiased journalism, let me be honest with you – you’re #$%in–A right it did. And it still does. This is Neal Adams in his prime — when no one drew a better angry preacher filled with righteous indignation — and he’s drawing, without question, the greatest angry, righteous preacher of all time. Additional reporting by Evan Narcisse.